What a wonderful word this is: FACTFULNESS ... invented by Hans Rosling, Ola Rosling and Anna Rosling-Ronnlund. It is the title of a book, written by the Rosling family ... father, son & daughter-in-law. Here's a write-up of it in the SMH. Hans Rosling died last year. He has featured on my website before, I am a great fan of this statistician ... watch his BBC documentary "Don't Panic - The Truth about Population", below; I keep saying to people: YOU MUST WATCH THIS. for which you have strong supporting facts. Relax & let that feeling trigger: ‘I don't know!’"
While I was writing the essay I remembered the mention of Enlightenment Now, by Steven Pinker. I had read about the book (both books are on order) and it comes highly recommended by Bill Gates, who calls it the best book ever, no less. 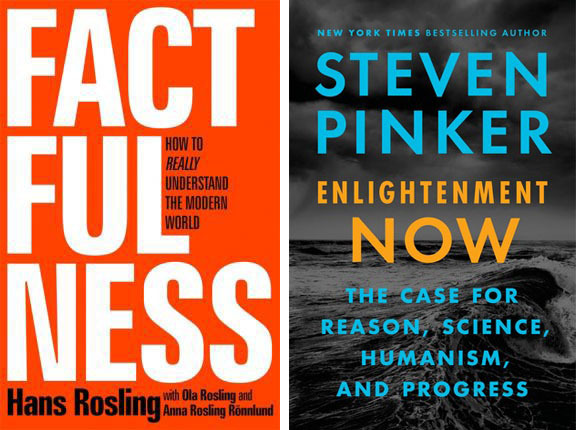 Pinker urges us to step back from the prophecies of doom and shows that life, health, prosperity, safety, peace, knowledge and happiness are on the rise. This truly is an absolutely must-see documentary, it will blow your mind (it blew mine) ... to begin with because of the way it’s made (it’s stunning, truly unique), but then the content is an eye-opener of epic proportions. The show truly is a game-changer, a shifter of paradigms, of deeply entrenched perceptions about our world. And to boot, it's the most uplifting, the most positive, the most satisfying documentary of late … what with all the gloom and doom out there.